I love reading a book set in the same time or place as what I'm living through: books set during whatever holiday I am celebrating or a story that takes place in Louisiana when I am on a trip to Louisiana. 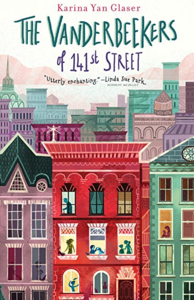 During the Christmas break, I read "The Vanderbeekers of 141st Street" by Karina Yan Glaser which takes place in Harlem during the week leading up to Christmas. While this was one of my final reads of 2018, this book was also among my favorite reads of 2018. The story begins on Friday, Decemeber 20th with the announcement that the Vanderbeekers' lease on their apartment will not be renewed, and they will need to move immediately after Christmas. The five Vanderbeeker children are devastated as they love their home, their neighborhood, and they don't want to move. With only a week to figure out what to do, Mr. and Mrs. Vanderbeeker are trying to find a new place to live. The Vanderbeeker children are determined to find a way to save their home by winning over their reclusive landlord. Their initial attempts to please him go horribly wrong, including dropping a tray of breakfast at his front door, but they persevere.The days wear on and hope draws dim, but these determined children find a way into his heart and save their home. I absolutely love the writing in this book. The reader is immediately drawn into the story and meets a wonderful cast of characters. The community feel in this book is strong and makes the reader root for the children to find a way to save their home. I thoroughly enjoyed this book, and I highly recommend that you read it this coming December. The best part....in December 2019, the dates and days will match those of the book...the book opens on Friday, December 20th, and December 20th in 2019 is a Friday. I love when the world around me matches a book like that, but even if the days don't match my calendar, this book is worth reading.